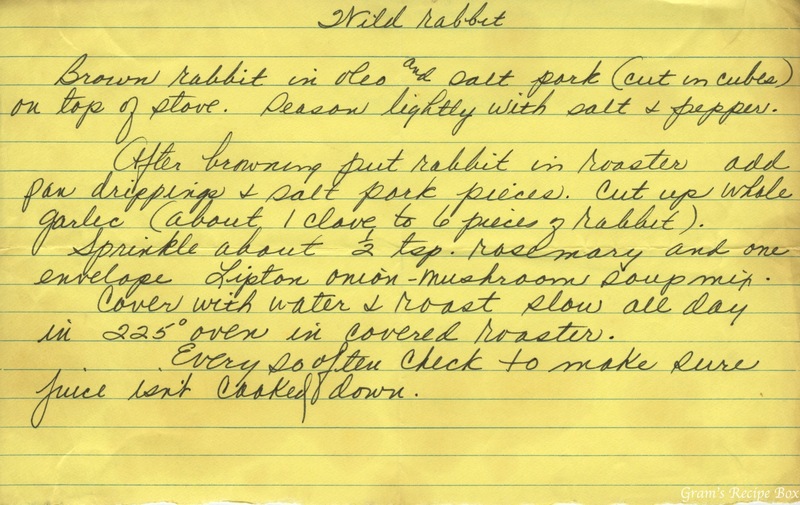 The recipe can’t be *that old* considering it is on a yellow legal paper, but rabbit is not among the most common meats available these days. It enjoyed a renaissance of sorts in the 1970s as an alternative to chicken. Game meats such as rabbit are often more lean and higher in protein than our standard fare of chicken, turkey, pork and beef that is factory farmed for mass consumption. I remember my mother prepared rabbit like fried chicken and it was quite good. Brown rabbit in oleo and salt port (cut in cubes) on top of stove. Season lightly with salt & pepper. After browning put rabbit in roaster. Add pan drippings & salt pork pieces. Cut up whole garlic (about 1 clove to 6 pieces of rabbit). Sprinkle about 1/2 tsp rosemary and one envelope Lipton onion-mushroom soup mix. Cover with water & roast slow all day in 225 oven in covered roaster. Every so often check to make sure juice isn’t cooked down. Anything with Lipton onion-mushroom soup mix can’t be that old either! Although I’m not sure onion-mushroom would be easy to find. Isn’t it just onion soup mix now? You can tell I don’t use it much. I found in my research that Lipton – and several others – began aggressively marketing their dehydrated soups in 1940, onion being the preferred flavor. In the 1950s onion dip made with Lipton onion soup mix and sour cream was popularized and away we go!